Sailors raise the ensign staff while preparing to enter port. A Sailor records a video of himself reading Green Eggs and Ham to send home. "Oscar" patiently waits for an opportunity to jump overboard. It's nice you guys have the ability to comm with family and friends back home that you do. 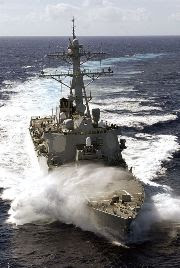 The USS Russell made the Navy.mil photo gallery in a most gorgeous fashion. Also, your ship going off to protect America HERE and HERE and your ship on CNN. I'm more than happy to contribute comments to America's top blog :-). GO NAVY!! I'm going to be working on a persuasive speech for my speech class, and I've decided to do Navy over USAF. In words that are printable and not too harsh, why did you choose Navy over Air Force, and why do you think the Navy is a buttload cooler? Of course, I know the answer to these q's, but I thought it'd be really cool to say "I talked to the XO of the USS Russell DDG 59 (the longer the title the better) and he says..." Oh BTW, anybody else wishing to help out is most definitely welcome. Thanks a million!